Take a byte out of geology with Mini Me Geology’s new Fun Formations collector mineral kit. This fun GeoBytes kit is perfect for kids who love to find interesting rock, mineral, and fossil samples. Minerals can form in a wide variety of ways in nature. This awesome mineral kit has samples of rock salt halite, chert, and opal. Also included with your samples is an information card with details about your new minerals and how they form. You’ll love these three amazing minerals. Add them to your rock and mineral collection today! 3 Minerals with Unique Formation Methods – Take a little byte out of geology with this fun GeoBytes kit with three minerals that form in unique ways. This kit includes rock salt halite, chert, and opal. Information Card Included – An information card with details about your new mineral specimens is included. Educational – Mini Me Geology’s GeoBytes kits are educational because each kit has a theme. 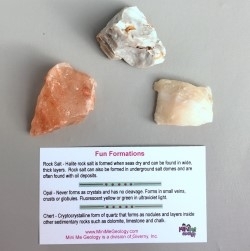 The Fun Formations kit teaches about different minerals can naturally form in nature depending on its environment. 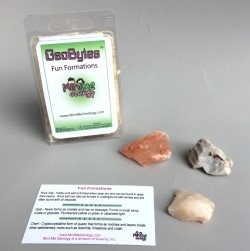 Fun – Mini Me Geology’s GeoBytes kits are fun because they include three unique mineral samples that are not always easy to find in nature. Perfect for Kids and Collectors – GeoBytes kits are the perfect kit for kids and adult who want to start or add to a special rock and mineral collection.